April's dream is to be a documentary filmmaker, she's lucky enough to have an internship with Walkabout Media & Productions to make that dream come true. However her chore is to get Josh Knox the infamous rock climber who prefers to free solo instead of climbing with the safety of a rope, to open up and give more than one worded clipped answers during an interview. Would she be able to break through his interview pretentiousness? Is it him or is it her? If it's him, why is he like this, is the camera an instant switch for "Jerk Josh"? (*direct book quote) April is able to crack his exterior but falls for him in the process. After what happened to her father, how will she be able to handle his choices? Will she be able to do the added job Danny's asked of her? Josh climbs rocks without a care in the world, or so it seems, what's really going on within and around him? No one else has gotten him to open up like this ever, now it's time to be filmed climbing Sorcerer Spire with its sharp twisting tower, without a rope. *Sorcerer rose from the valley floor to the sky in an uninterrupted swoop. But unlike El Capitan and the other formations, the rock of the Sorcerer was nearly black. (*direct book quote). *“Is it normal to climb ropeless?” she asked. Madigan laughed. “No. It’s not normal. Only the crazies and the insanely good do it. When you climb without a rope, it’s one wrong move and you’re toast.” “Technically, he’ll be free BASEing. Climbing with a parachute in a backpack. It could save him if he falls from high enough, if he pulls the cord fast enough.” (*direct book quote). What happens between Josh & April? How does his Sorcerer climb go? You'll have to read LESSONS IN GRAVITY to find out, but man will it be worth the time it takes for you to read it! It's an EXTREMELY EXHILARATING and emotionally filled story that'll have you laughing, crying, smiling, and falling throughout. This is my first, but definitely not my last Megan Westfield story; what e debut novel! I received an ARC via IndieSage through NetGalley in exchange for a blog tour review. Due to sexual situations, this book is recommended for readers 16 and older. -We’re not alone in this—always remember that. -What good is life if you’re not living it? 5.0 out of 5 starsA beautiful masterpiece! I struggle with third person point of view because I just never seem to get a good connection with the characters. Lessons in Gravity and Megan Westfield have me thinking that it's not third person, it's the story and how it's told! This book absolutely floored me! It was a beautiful masterpiece! The subject was intriguing and is what initially caught my attention but the writing, the actual story...wow! I felt so much of this story it blew my mind. Were there some things that I didn't like? Sure but to be honest, they were all personal preference things like I didn't necessarily agree with all of Aprils actions, specifically toward the end but I could understand them. It didn't stop me from falling for both of these characters any less. This is the first book I've read by this author and then to realize that this was her debut..I'm definitely a new fan and she is now on my auto-buy author list! It's been quite a while since I read this book, but just finished the author's second book and knew that I needed to write a review for the author's first book. I frankly had not read this Genre of book in a LONG time and as a parent to extremely young children, I have to be quite choosy about what I pick to read. Well, I am QUITE happy that I chose this book. I read it over 2-3 Saturday evenings, so it engaged me so much that I didn't want to put it down, but could only find time on Saturday evenings to read it! This book drew me into Yosemite and the rock climbing community while adding a Love story to it. 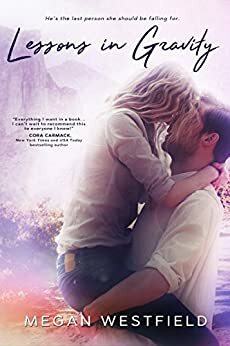 I thoroughly enjoyed the book and highly recommend it for other readers whether your interest is California, Yosemite, Rock Climbing, filming, or Love. This story has a little bit for everyone. What an incredible journey. Such a well-researched book action-packed with romance, climbing, and hiking in the beautiful Yosemite setting. The ending was so satisfying and perfect for the novel. I let my 15 year old niece borrow this book, and she read it in one day and said it was a new favorite. I can't wait to pick up Megan Westfield's next book, Leaving Everest. I've known Megan Westfield for a long time and it is a pleasure to see her first book come to fruition. I'm a huge fan (a bit biased of course, since we served together). I love all the little details, love that the female character is adventurous, creative and daring. It's a pleasure to read a book about a female creative in a field dominated by men. And, adventure sports to boot! There a not very many female adventure photographers or videographers out there. The few I know are awesome and badass, just like Megan's character! What a great read! Well-written, well-developed characters, an amazing setting,, and a story with just enough suspense to keep me up late compulsively reading.. I can't wait for her next book to come out!